This particular bag from Evergoing has been discontinued but we do stock a nice backpack style drybag with a similar capacity and price. See our main drybag section for details. Although the pvc this dry bag is produced from is not of the same abrasion or tear resistance as the pricey Ortlieb dry duffel bags we sell, for $39 you get an unbelievable amount of drybag. 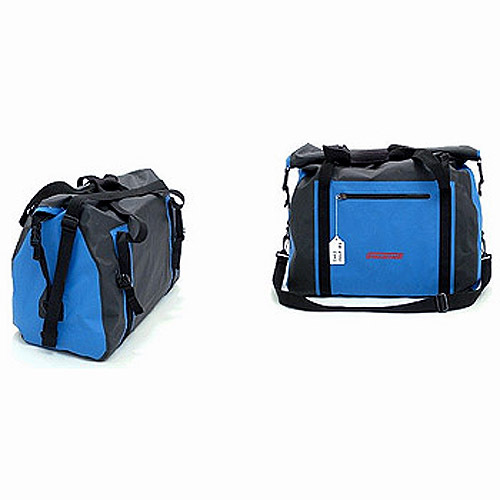 Unlike many waterproof duffel type drybags, this one includes two straps that run over the top of the rolled closure, in the same way the regular standing four-strap drybags do. This means it really can survive in a flipped raft. It also has an exterior map pocket with a dry zipper, something you would never expect to find on a bag of this low price. All straps on this bag are removable, and it measures roughly 10" wide by 21" long. It is 11" - 12" tall when rolled down and about 14.5" open. We are not sure of the exact denier of the base polyester fabric; probably it's about 500d, and it feels like maybe 20 ounce per yard in weight. The actual weight of the duffel dry bag is 2-1/2 pounds.